Why do Sea Hawk Paints outperform other bottom paints by 30%? Simply stated, it’s in the ingredients. Sea Hawk uses only raw materials mined in the United States, like premium domestic copper, virgin grade solvents and rosins and higher pigment content. Premium quality U.S. copper, ground to 50 microns, gives Sea Hawk an optimum and consistent release rate for superior antifouling performance. Common brands with inconsistent or a coarser ground copper may present problems with adhesion to the hull, in addition to their inconsistent release rates. Sea Hawk uses only virgin grade solvents, giving our products a superior consistency and premium anti-settling characteristics. What does this mean? Sea Hawk is easier to apply, saves you time and outperforms the competition. Barrier coats made with virgin rosins are your #1 protection against electrolysis. A superior buffer between antifouling coating and your hull can reduce electrolysis and protect your boat’s critical systems. 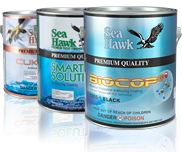 Sea Hawk’s higher pigment content produces more reliable, consistent color. If you keep your boat out of the water or trailer it frequently, a consistent color on the bottom is just as important as the appearance of your freeboard and topsides. From time to time, your boat may need to be surveyed for insurance or selling purposes. If you keep her in the water, a clean bottom with consistent color shows that your vessel has been well cared for.